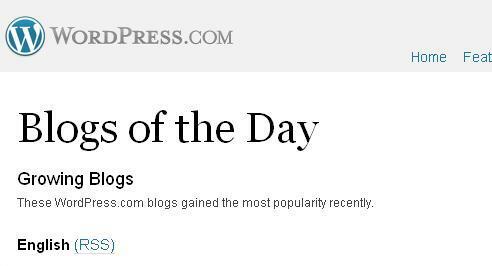 WordPress included my blog in their “Blogs of the Day” list! WordPress.com (my blog host) has included my page in their list of “Blogs of the Day” under the “Growing Blogs” category last Sunday morning (Philippine time). At one point, “Asking about anything, Writing about everything” was listed (or should I say ranked?) 33rd among the 100 featured blogs there. Everyday, WordPress comes up with a list of 100 "Growing Blogs"
With me on the list are other WordPress users from around the world – people who are blogging about all sorts of stuff. There’s a photoblogger from New York, an animal-rights activist (currently listed at number 32), someone from Iran, Indonesia, and European countries as well. These blogs, according to WordPress, has “gained the most popularity recently.” As of yesterday, my blog has already received over 13,000 views. According to topblogs.com.ph, it is already the 31st most-visited page in the Philippines under the “news and journalism” category (at least among the sites registered to them). It is said that a writer has two universal goals: to be published, and to be read. I cannot thank my readers (friends, Facebook contacts, subscribers, and online lurkers) more than enough for visiting my page. Graduate school commitments may force me to slow down in blogging for the coming week, but rest assured, I’ll never run out of something to write about. But just a reminder, the rankings are highly fluid, so by the time you are reading this, I may no longer be in WordPress’ list.